Resource guarding is a normal canine behaviour. In order to effectively deal with resource guarding, we must acknowledge that it is a normal canine behaviour, essentially a built-in loss prevention technique. Our dogs exist in part because their ancestors were careful to maintain possession of hard-earned resources. So let's get this straight: from the canine perspective, there is nothing inherently wrong with asking someone to leave your stuff alone. 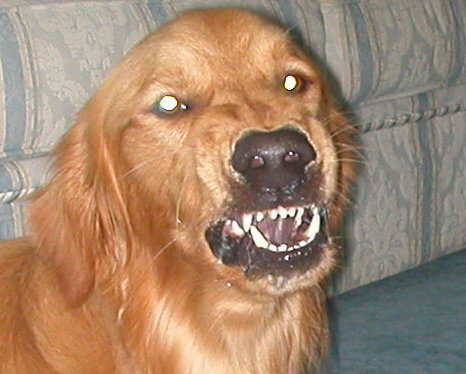 But my dog shouldn't be aggressive toward me. Forget that we're talking about dogs for a moment. Who is the aggressor when one person quietly approaches another and takes his wallet despite verbal protest? Verbal protestation, or growling in the case of the dog, is a distance-increasing behaviour whereas true aggression is more accurately characterised by distance-decreasing behaviours. Now imagine parents with a long-standing history of taking their teenager's wallet, adding funds, and giving it right back. How do you think the teen will feel if his dad occasionally borrows money from his wallet? By doing this with young puppies, we can proactively prevent resource guarding, and by doing this more slowly with dogs who already guard, we can effectively change their entire view on loss prevention. Close the economy on food, toys, and other resources so that all encounters are well controlled. At mealtimes, approach your dog's empty bowl, drop in a small portion of his meal, and walk away. Once he has finished, approach with another portion, and repeat. Once your dog is clearly relaxed and happy every time you approach his bowl, bend down a bit to drop in the portions. Progress slowly until you are touching his empty bowl, then picking it up to fill it. Your dog will start to look up in eager anticipation every time you walk toward his bowl, even while he is eating. It is now time to put boring kibble into his bowl and approach with a high-value treat, such as steak, while he is eating. You are ready for this stage when he happily looks up from his bowl, even momentarily, without showing any sign of stress or body tension. Toss the steak into his bowl and walk away. Proceed in increments as small as the above until your dog loves it when you take away his food bowl and come back with something better several minutes later. Once your dog is practically begging you to take his food away, you are ready to slowly work up to more and more enticing resources until you are able to safely dive into his jaws and pry out a dangerously small bone while he's thinking "sweet, she's probably about to smear peanut butter on it!". You can also teach your dog to willingly hand over objects on cue. If you are struggling with the concepts, then instead of using a command like "drop", "out", or "give", use "bonus!" or "upgrade!" to signal that your dog is about to get something better than what he has, in addition to usually keeping his existing prize. Disclaimer: the information in this post is not intended to substitute for consultation with a certified professional dog trainer (CPDT), canine behaviour consultant, or veterinary or applied animal behaviourist. At no point should you ever provoke your dog to exhibit resource guarding behaviours, and if you are unable to do these exercises completely conflict-free, then please consult with a professional instead.